July 30th marks the 49th anniversary of the establishment of the Social Security Act Amendments. 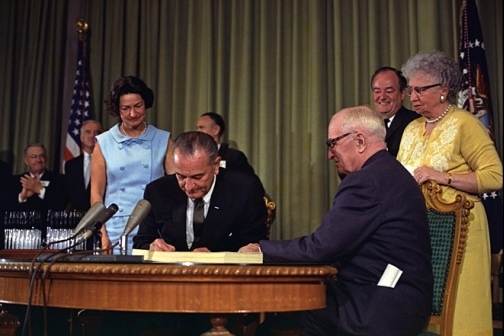 In 1965, on this date, President Lyndon B. Johnson signed into law what is better known as the Medicare law. This established both Medicare, the health insurance program for Americans over 65, and Medicaid, the health insurance program for low income Americans. You can read this Public Law in the United States Statutes at Large on GPO’s Federal Digital System (FDsys). Former President Harry S. Truman participated in the signing ceremony with President Johnson at the Truman Presidential Library in Independence, Missouri. President Truman’s participation served to recognize his effort during his administration to establish a national health insurance program. 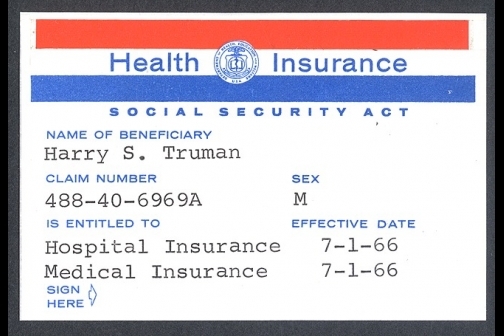 President Truman and former first lady, Bess Truman, received Medicare registration cards numbers one and two. The 1950 Census showed that the aged population in the U.S. had grown from 3 million in 1900 to 12 million in 1950. The jump was even greater between 1950 and 1963, growing from 12 million to 17.5 million, a large number of whom had no health insurance. It’s no surprise that in the program’s first three years, nearly 20 million beneficiaries enrolled in Medicare. Fast forward to today, and Medicare provides health insurance to about 50 million Americans. The Centers for Medicare and Medicaid Services (CMS), a division of the U.S. Department of Health and Human Services (HHS), administers the program. 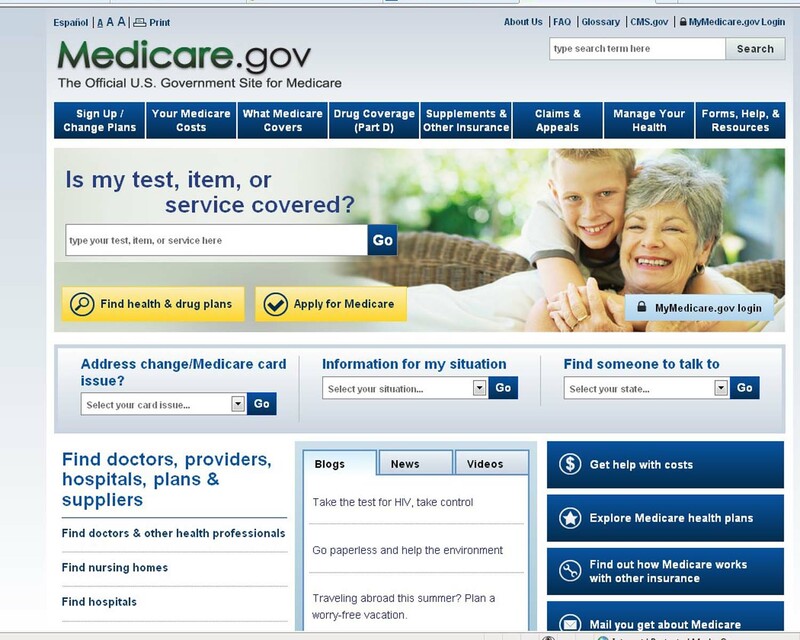 Finding Medicare information and services has never been easier than with www.medicare.gov. Reporting lost or stolen Medicare cards. In addition to that, the site offers access to podcasts, videos, and blogs that are not only interesting, but very informative. You can also connect with Medicare via Twitter and YouTube. The U.S. Government Printing Office (GPO) also provides access to a wide variety of Medicare resources. The U.S. Government Bookstore sells the CMS-1500, the standard health insurance claim form developed by the National Uniform Claim Committee and used by all non-institutional medical providers or suppliers to bill Medicare carriers. It is also used to bill some Medicaid State Agencies. Medicare & You 2014 is an official Government booklet that summarizes Medicare benefits, coverage decisions, right and protections, and provides answers to frequently asked questions. This eBook is available in Mobi, ePub, and PDF formats. Choosing a Medigap Policy: A Guide to Health Insurance for People with Medicare is an official Government booklet that contains information on choosing a Medigap policy to supplement the original Medicare plan. This eBook is available in Mobi, ePub, and PDF formats. Your Guide to Choosing a Nursing Home is an official Government booklet that contains detailed information on choosing a nursing home, as well as costs and coverage. This eBook is available in Mobi, ePub, and PDF formats. Protecting Access to Medicare Act 2014, Public Law 113-93: To amend the Social Security Act to extend Medicare payments to physicians and other provisions of the Medicare and Medicaid programs, and for other purposes. You can also access countless Federal Government documents related to Medicare at Federal depository libraries nationwide. Find the Federal depository nearest you by visiting the Federal Depository Library Directory. Happy Birthday, Medicare, and here’s to many more years of helping the American public! How can I find these Medicare publications?